I’m a big fan of the Clarion writer’s workshop. It has turned out some amazing authors, and looks like such a fun experience. Someday, I’d like to be able to participate in it. But for now, I can participate in the Write-a-Thon, to raise some money for this fantastic program, and get a bit of writing done, to boot! My goal this summer is to draft, edit, and submit three new short stories. 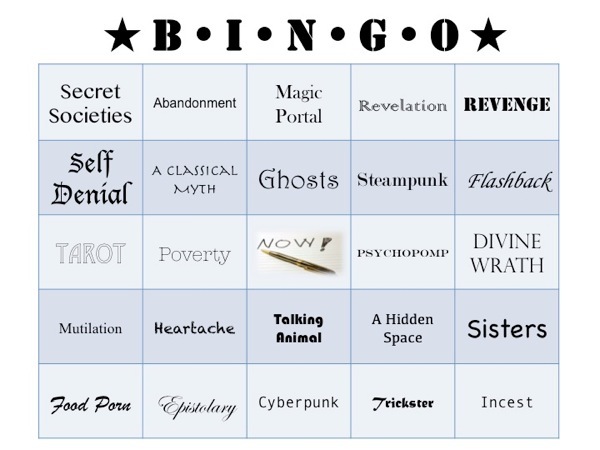 To help myself decide what to write, I spent this evening putting together a BINGO card (which Drew then made pretty for me). Each story that I write this summer should complete either a horizontal, vertical, or diagonal BINGO. But it wouldn’t be a Write-a-Thon without some audience participation! Therefore, I’m giving you all the chance to sponsor me if you also want to help out Clarion. $50 Editing and feedback* on any work under 50k, or on-call** cheerleading/brainstorming services via e-mail, IM, or Skype for an entire week! I will also throw in a Tarot reading for your current story or any of its characters. $100 Editing and feedback* on any work under $100k, with on-call** cheerleading/brainstorming services via e-mail, IM or Skype for a month! In addition, you will get a Tarot reading for your current story or any of its characters, a personalized BINGO prompt card, a video trailer for your story, and something awesome*** handcrafted by yours truly. * When it comes to editing and feedback, I’m very versatile. I can do surface-level polishing of spelling and grammar (be warned — I am an English teacher! ), or I can give you more in-depth feedback on plot, characterization, or just about anything else you can think of. ** You can choose between any of my delicious baked goods, a pocket shrine or set of 10 inchies, or a poem. At our church every Sunday, we have a moment I treasure called Joys and Sorrows. The celebrant usually introduces it with, “As we travel through life, each of us comes upon high and low points in individual journeys. By sharing these peaks and valleys with others, our sorrows are lightened and our joys enhanced.” I’m not sure if this is a peak or a valley I’ve stumbled upon. Maybe it’s both — a swaying rope bridge suspended high over a valley. My blog has sat empty for a few weeks now while I started the journey across it. But now that I’m feeling more secure in my footing, I’m ready to share. 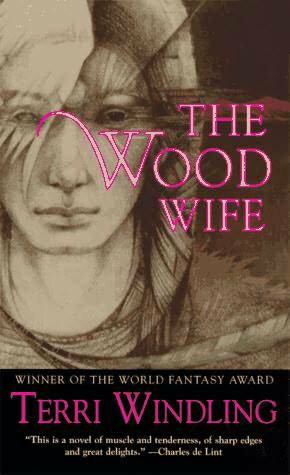 Tomorrow, I’ll be posting about Terri Windling’s fantastic novel, The Wood Wife, which I made a point of re-reading four years ago when my husband and I moved from the lovely bayside town of Bellingham to the shrub steppe desert of Yakima. It’s been a joy and a challenge living here — I’ve grown a lot, met some fabulous people, and even learned to appreciate the beauty of the red hills that loom like sleeping dinosaurs on the horizon. For awhile, we strongly considered buying a house and settling down here. But if we did, I think that’s just what it would feel like — settling. In our hearts, we’ve never stopped thinking of Bellingham as home. 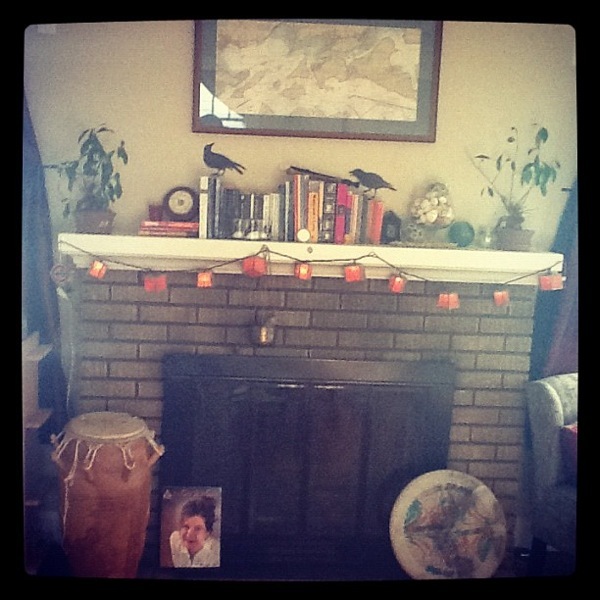 We even have a map of Bellingham Bay over our mantle. Soon enough, we’re going to see it again in person. I’ve resigned from my job, and we’re preparing to move back to the town we love. In The Artist’s Way, by Julia Cameron, I found a quote that has been my motto: Leap, and the net will appear. I don’t have a new job lined up yet , and I’m going to miss the community we’ve found. We’ll almost certainly take a hit financially. But in a way, it’s never going to be easier to move than it is right now, while my husband is in graduate school and we don’t have any kids. It’s a leap of faith — but even if the net doesn’t materialize, hitting bottom, in this case, won’t be all that bad. God knows we’ve learned how to live cheaply in Bellingham. And this move will put us closer to family, and to used bookstores, and coffee shops, and public transit, and a million other things that have made my life poorer through missing them. At any rate, I’m seeing the road ahead, not as a trial, but as an adventure. I’m looking forward to these next few months, rickety footbridge and all!